I’ve covered most therapy areas during my career in healthcare advertising but in the last 6 months I’ve written extensively in the areas of rheumatoid arthritis, psoriatic arthritis, cold and flu, food supplements and cough remedies. Read more about ongoing work in specific therapy areas here. Areas that I have particularly enjoyed writing about include renal cell carcinoma, glaucoma, pain management, post-menopausal osteoporosis, psoriasis, dermatitis, prostate cancer, vaccines and allergy. Click here for two good reasons to use me. 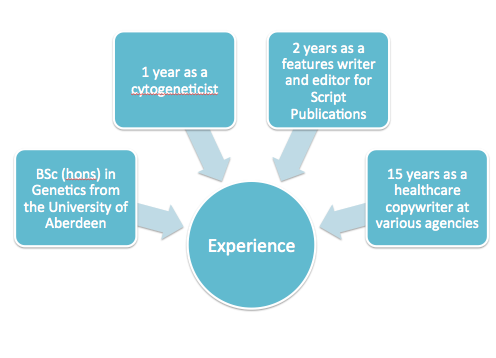 I have the ability to write compelling copy for a diverse range of audiences; across therapeutic areas and communication channels. I can turn complex medical facts into a story that complies with the ABPI Code of Conduct and is fully referenced (with a marked-up reference pack too!). If yo uneed me to help out with Zinc, I can do that too. Get in touch here if you’d like to see a copy of my CV.